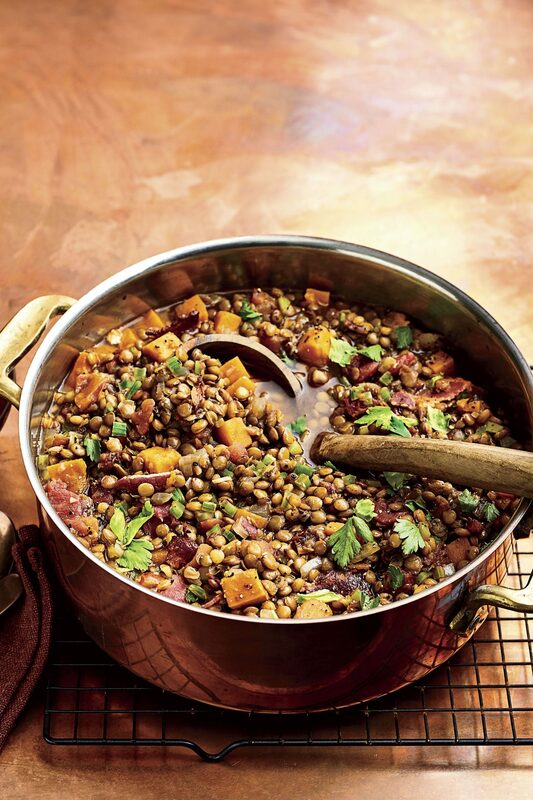 Nothing says comfort like a warm bowl of soup, and you'll be comforted to know that these less-than-300-calorie soups won't contribute to a winter bulge. 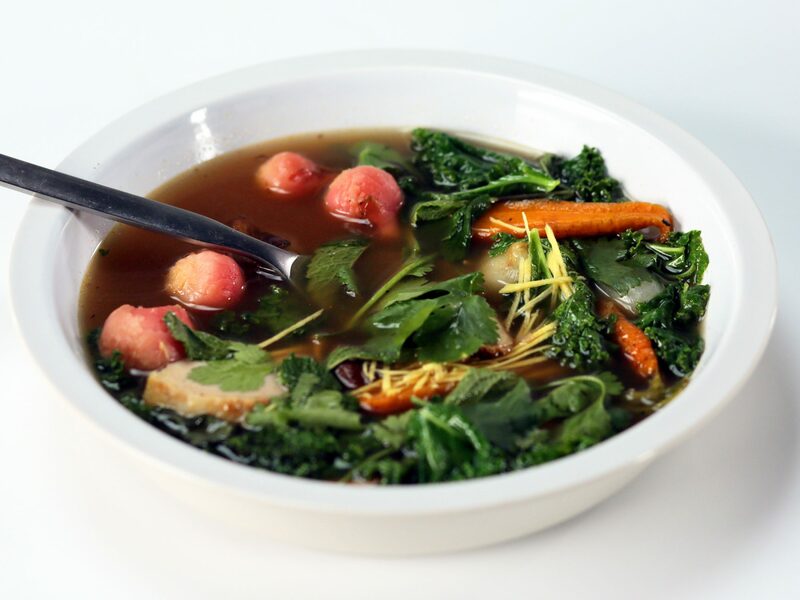 The best part about this low-cal soup (other than eating it) is the make-ahead factor. Prep this creamy soup in the morning. Then, all that's left to do is heat. 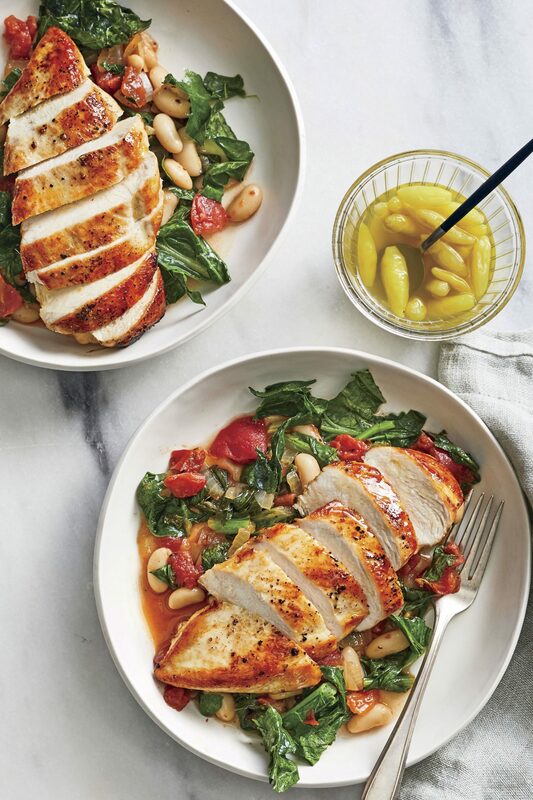 Roasting the tomatoes adds an intensely deep flavor and buttery texture that defines comfort in just 91 calories. A gentle simmer keeps the vegetables in the soup slightly firm, so they maintain their texture during freezing and reheating. Savor this low-calorie, Mexican-inspired chowder made with corn, black beans, red pepper, and onion. Top with 2% Greek yogurt, a sprinkle of cilantro, and one lime wedge. Yellow tomatoes are a little less acidic than red, making this chilled soup's flavor sublime. 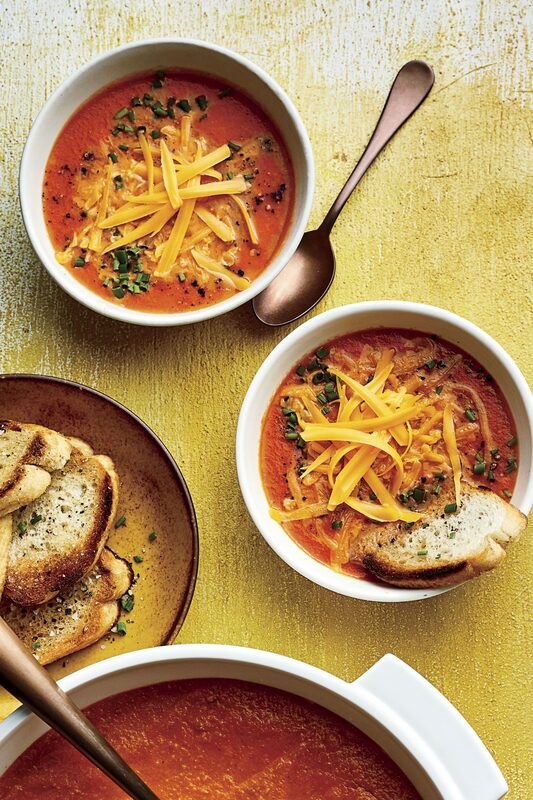 Loaded with the antioxidant lycopene, this tomato soup is pumped up with flavor from onion, fennel, and garlic. Serve each bowl with a slice of cheese toast. 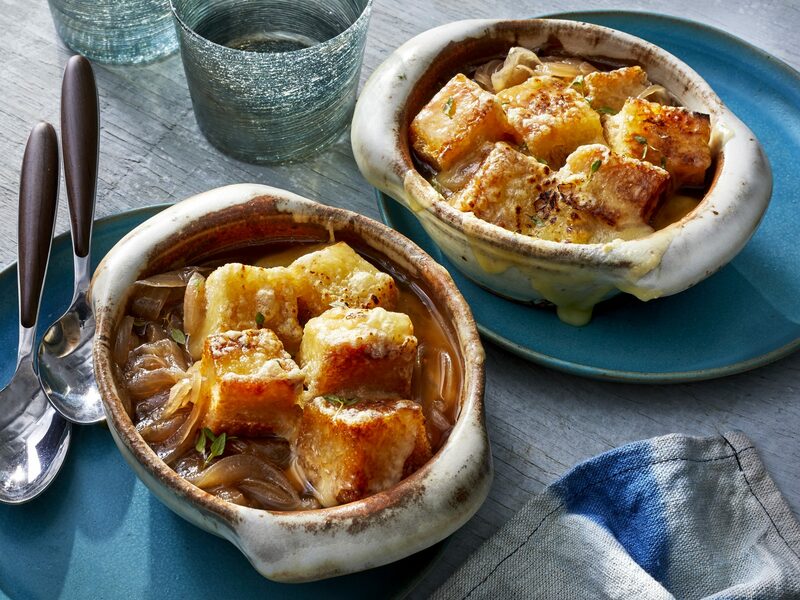 Slowly cooking the onions brings out their sweet flavor in this healthy French onion soup. The soup itself can be prepared up to two days ahead. When ready to serve, add bread cubes, top with cheese, and broil until the cheese is golden. Even with fried tortilla strips, this Mexican soup boasts fewer than 150 calories per serving. Serve with light sour cream and 2% cheese for low-cal toppings. 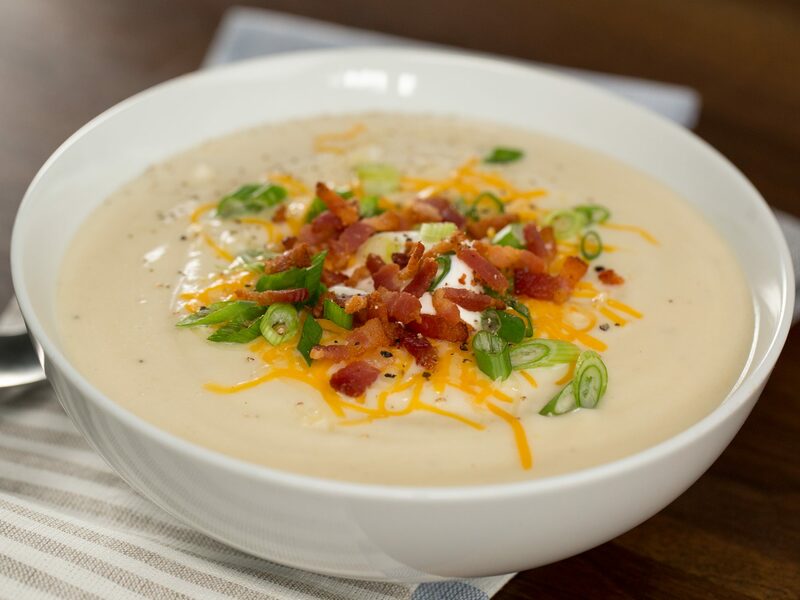 Most chowders are often high in fat and calories because they contain cream, but with fat-free milk and just a sprinkling of bacon, this lightened version has only 257 calories and less than 3 grams of fat. Plus, it has the same creamy texture and mouthfeel as a traditional chowder. Chili oil and white pepper provide the heat and lemon juice provides the sour, so adjust accordingly to your taste. Bamboo shoots and mushrooms help make this healthy soup filling, and both shrimp and tofu are lean protein sources. 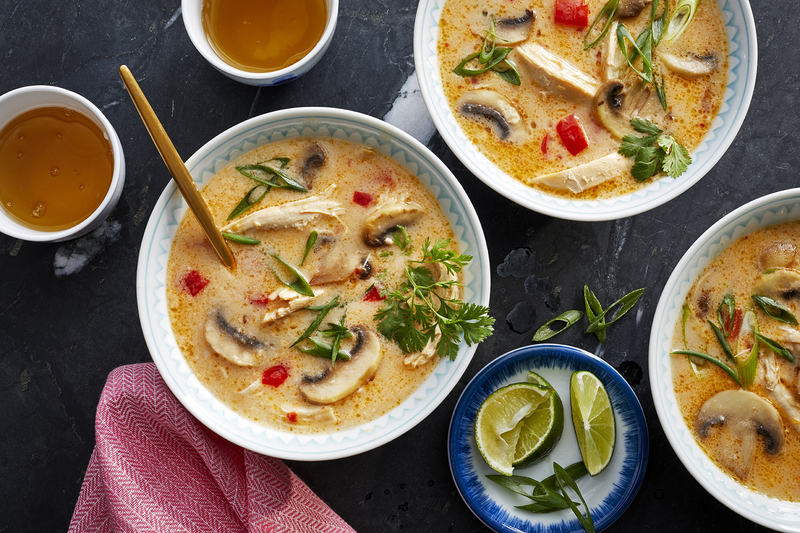 Grated ginger and lemongrass give this traditional chicken noodle soup an international flair. Feel free to customize it by adding extra vegetables such as mushrooms, peas, or carrots. In less than 45 minutes, you can enjoy this warm and hearty potato-crab chowder, a New England classic. Lump crabmeat offers a generous amount of flavor but for an inexpensive option, substitute canned crab meat or even chopped cooked chicken breast. Navy beans, leeks, carrots, tomatoes, potatoes, and zucchini combine for a heart-healthy soup that takes the chill off a cold winter night. The flavorful topping is a basil pistou, a mixture similar to pesto minus the pine nuts. This classic soup features italian sausage and plenty of grated parmesan cheese. Process this hearty vegetable soup in batches for a creamy finishing texture. Simply elegant and delicious with its French baguette crouton and mixed herb topping, this dish is perfect for serving to guests. This 5-star recipe boasts over-the-top flavors from turkey kielbasa and a variety of vegetables. Best of all, it takes less than 30 minutes to make. 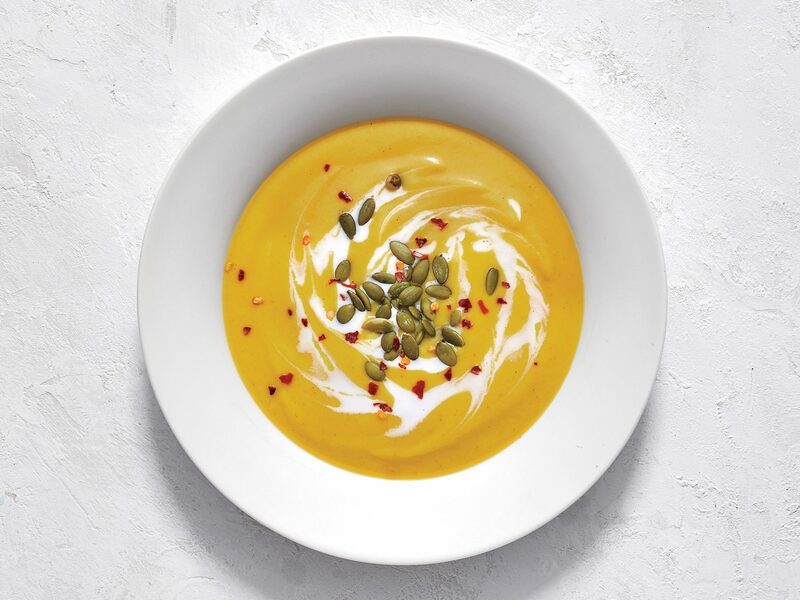 This creamy butternut squash soup features pureed butternut squash, carrot and onion and showcases the rich, sweet flavor of this winter squash.